I recently went to the Liz Earle store in the Victoria Quarter in Leeds for the first time. In honesty, I went with a friend who had vouchers to spend, but I ended up shopping myself too! I’ve used Liz Earle products before, bought by mail order, and really liked them, so I’m not really sure why I’ve not been in store before. Anyway, suffice to say I’ll be going back. The store is a large one, covering two floors in the prestigious and beautiful Victoria Quarter in Leeds and is a really light, calm and welcoming space, giving very positive first impressions. There are lots of products out on display, but the real joy of this store is their complete understanding that before we buy a product, most of us like to try it out. What does it smell like, feel like, look like? How do I apply it? How does my skin react? All those questions, and more, can be answered by testing (playing!) with the products at the many spaces around the store. Recently has seen the opening of a treatment room in store. This restful space will be used for providing facials using the Liz Earle range, which would be such a treat. I want to be the the woman having the facial in this photo! 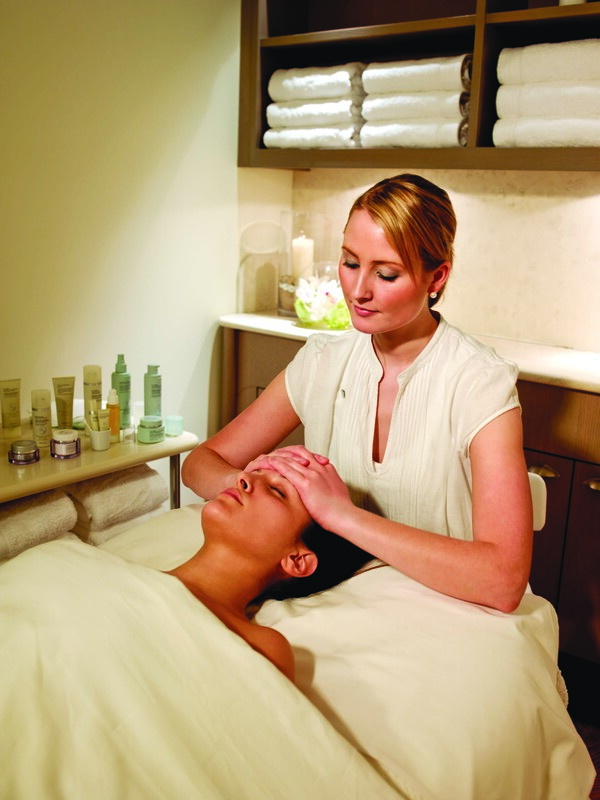 The Signature Facial was the highest rated in a Vogue magazine review of ‘wonder facials’. As for the products themselves, I think they are brilliant. I bought the multi award-winning Cleanse and Polish Hot Cloth cleanser, which is applied to the face and then washed off using the accompanying muslin cloth, therefore it acts as a gentle exfoliator too. I’ve been using this for a while now and my skin loves it. Alongside the cleanser, I bought a sample sized Skin Repair Moisturiser, which has also been lovely to use. Because I’d bought these two, I got another sample sized product free, so I chose the Superskin Concentrate which I’ve used at night. It smells glorious and feels very nourishing. This is a long term offer and one that I think is another great example of excellent customer service, giving the opportunity to try new products at a reduced cost, or perhaps use the smaller sized versions for holiday. The other thing I love is their range of ‘Try Me’ kits – also great for holidays or just trying smaller sizes out before you commit to a more expensive purchase. Alongside the facial products is a full range of body products, sun protection and aftercare and men’s skincare too. I have friends with really sensitive skin who say that the Liz Earle sun protection cream is the only one that their skin doesn’t react to. They’ve recently launched a range of make up, which I’ve not tested yet, but it’s on the to-do list! If I haven’t convinced you enough, what with the ace products, cake and great offers, I’ll tell you that they’re BUAV approved and British, with a headquarters on the wonderful Isle of Wight, where one half of my family are from. Excellent. I love the cleanse and polish hot cloth. It’s like Ronseal, does exactly what it says on the tin and removes every scrap of make up. Will have to try some of their other products, as for the make up – not sure anything could prise me from my beloved Chanel.